Ask fellow campers about "Oak Creek Mobilodge" and nearby attractions. 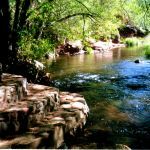 A location within walking distance of Sedona's gallery row is this park's best attribute. Entry from the highway can be a challenge for larger rigs a it requires a tight turn down a steep hill onto a paved driveway. The park itself is gravel with little to distinguish between the access roads and sites other than utility poles. This is a very crowded park, with a few RV sites surrounded by a couple of dozen permanently-placed mobile homes. Water, sewer, and electrical hookups were conveniently placed. WiFi signal was strong, but thruput was only modest. We didn't use the bathrooms. The laundry facility was temporarily unavailable for maintenance reasons. A cheerful, helpful staff person met us as we entered, directed us into our site (we had a reservation), encouraged us to settle in before registering, took our payment, and offered many suggestions for our enjoyment of Sedona. We thought this was a reasonable price for such a good location. We camped at Oak Creek Mobilodge in a Motorhome. We made last minute reservation over phone, the owner was very nice. We stayed 5 days with a 32 foot 5th wheel. Management checked in with us several times to make sure we were comfortable. We arrived on a Friday night the weekend of the October feast, was a little noisy first night but all other nights were quite. This places has mostly permanent trailers that are rented nightly or monthly, many are people who live here permanently. Plenty of room between trailers but tight trying to get parked, doable but if you're not good at parking your trailer don't try here. If you are larger than 32 feet I wouldn't recommend it. Bring a smaller trailer it's worth it to stay here. Has the oak Creek creek 100 feet from trailers with a cement patio and tables overlooking it and stair access for going down to it. A little beach area and several areas to fish for trout. Permission was given to pan for gold if we wanted to. Gravel site was level, WiFi was great. Recommend highly. Thanks Oak Creek. We camped at Oak Creek Mobilodge in a Fifth Wheel. Sedona 1 mile. Fishing at the fish farm. Get a coupon for the free fishing at the visitors center. You only pay for the fish you catch. Airport best panarama photograph. Montazuma Castle 25m, Jerome 35m eat at Haunted Hamburger art galleries,shops worth the drive plan an entire day for this excurtion. Visit Slide rock 8 miles 80 foot natural slide, Barking dog on hwy 85 has cactus fries. We stayed here 6 nights in April. At first glance this campground seems like a dump. The bathroom and shower were shabby. Not growing mold or anything, but not the cleanest. The office is rarely open and reaching them to make a reservation took days. But we loved it! 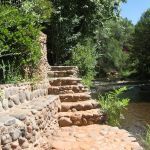 It is a great location, right next to downtown Sedona. A short walk to Tlaquepaque Village and short drive or longer walk to main street. The site was unkempt dirt but big enough for us to fit our bug rig and a 10'x10' canopy. We were right next to the laundry and bathrooms. They were sold out but we were the only ones using the shower the whole week so even though it wasn't the nicest, it was pretty much for our private use. Everything was chill and friendly as opposed to the fancier park up the road that was sold out and had a ton of rules posted on their site. There's a pretty steep hill in and out of there. It is tight but doable. A loop, so you should not have to back up at all. We would stay here again. We camped at Oak Creek Mobilodge in a Fifth Wheel. Very few campsites, tight fit for 40+ campers, entrance and exits for very extreme and difficult to tackle 20% grade. The mobile homes are wrecks and junkie. We camped at Oak Creek Mobilodge in a Motorhome. First of all, this is a trailer park and it is a bit of a run down trailer park. If you don't want to stay in a trailer park, then don't come here. It's not the nicest environment but the staff is friendly and helpful and we found the people living here to be nice also. Our space was big enough for our long rig & tow unhooked. On the con side...we have a 40 ft motorhome and tow and someone should have told us to unhook before coming into the narrow turn entry down a steep hill. How my husband made this turn, I still don't know. I made a point of telling the staff that they should tell people this ahead of time. Getting out of the park wasn't bad but we didn't hook up until after we exited. A tenant did have to move her vehicle for us to turn the corner on exiting but she was very nice about it and was coming outside before I even went to her door. If you have a large rig and don't really know how to maneuver it, don't come here. Could not get satellite because of the trees. Pros..VERY quiet, great Verizon data and cell service, great location as it's close to the Y. Great price for the area. I felt uncomfortable here at 1st but it was better the longer we stayed. We stayed 5 nites. Not a lot of places to walk the dog but it was okay. We camped at Oak Creek Mobilodge in a Motorhome. We have stayed at over 70 RV parks since we left Tampa last May and this is only the 2nd we drove in and immediately left. It is a ghetto. The steep slope down is not meant for a larger rig let alone a toad and did damage to our gear. The full time residents stared at us with surly looks. It is absolutely beyond imagination why anyone would stay there let alone give it a good rating, which fooled us into trying it out. The lady on the phone was very sweet; otherwise this place is a nightmare with an awful local reputation for low class residents..beware. We camped at Oak Creek Mobilodge in a Motorhome. Best bang for the camping dollar we found on a 4 week trip. The Owner goes the extra mile in accommodating you. This may not be the most impressive place too see, BUT it will be among the best you will encounter -especially in Sedona. The competition wanted to charge us 8.00 per nite for our 2 greyhounds. Don't waste your money or time going there if the Owner has room for you - call him first because space is limited. Also, it is in a great central location. We camped at Oak Creek Mobilodge in a Motorhome. Small trailer park. Steep hill into park. Noisy. Didn't use the laundry or showers. Didn't like the way they looked. Owner was helpful on registration. We camped at Oak Creek Mobilodge in a Fifth Wheel. It's all about location at this park. Close to everything you'd want to do in Sedona. Walking distance to a few shops and restaurants, as well as trails, and a short drive to everything else. The staff here is extremely friendly and helpful, the Wi-Fi is strong, and the full hookups were perfect. We didn't experience any problems with the water pressure being too high, as mentioned in the previous review. We have a simple solution for that, turn the knob a bit lower! There are many full timers here who were polite and friendly, and we enjoyed chatting with the few we met. We loved the trees and the surrounding scenery. Nice and quiet at night, too. We camped at Oak Creek Mobilodge in a Motorhome. Fairly close to Sedona, about one mile. Very tight spots to get into, even though they are pull throughs. Water pressure is so high it blew a water fitting on our coach and two others that were there at the same time. They DON'T warn you ahead of time and it didn't matter about having a pressure regulator on the hose (we all did). The cable is inoperative and it is in a small shady canyon, so no satellite. You cannot see the creek without going down in between the trailers and then climbing down a stone wall to get to it. The number of spots varies as the owner is selling off some of the 50 year old permanent trailers. So more may open up. The vast majority of the park are permanent residents, probably local workers. However, it was quiet, cheap, the sites were level and the internet worked well. We camped at Oak Creek Mobilodge in a Fifth Wheel. We were planning to stay at the "other" Sedona park since it seemed to have more amenities, in spite of several reviews that had negative comments about the management. When I phoned to make the reservation, I understood very quickly what they meant, and opted for this park instead. It may be the humbler of the two, but in my book, friendly helpful service goes a very long way, and the staff here was great. 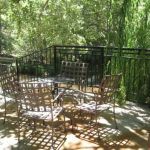 Walking distance to several restaurants, hiking & mountain bike trails, and only a mile or two from town. We had no problem with the water pressure as mentioned by previous reviewer, so perhaps it was a temporary situation. We were in a 28' trailer, and had no problem maneuvering into the site, as it was a pull-through. I would definitely stay here again. We camped at Oak Creek Mobilodge in a Travel Trailer. Although very rustic, this is an excellent place to stay (although pricey) and visit all that Sedona has to offer. There are many things to do in Sedona, go to visitors center and get mounds of information. Driving up Oak Creek Canyon is a must, go all the way up the switchbacks to the viewing area about 16 miles out of Sedona. Lots of off-road for Jeep enthusiasts. Are you affiliated with Oak Creek Mobilodge ?